Children can be pests at times—especially other people's children. On a hot summer day, we might spray them with the garden hose, but we would never spray anything toxic on our lovable little kid-pests. Unfortunately, there are other ways that children come into contact with pesticides, many of which can be easily absorbed into their bodies. Is this a problem, and if it is, what can we do about it? Pesticides are manufactured for a wide variety of purposes, and they come with a wide variety of side effects on the endocrine, nervous, and immune systems of human beings. Adults are susceptible to these effects, but children are even more likely to suffer negative effects from pesticide exposure because of their lower body weight, their less developed immune and detoxification systems, and the fact that they're still growing. Children may be exposed to pesticides from residues in food, in their homes or yards, or in schools, parks, and playgrounds. Pesticides are even starting to turn up in our freshwater supplies. In and around homes, children spend more time than adults on floors and lawns, where pesticide residues are often found in high concentrations. Pesticides also don't always stay where they are applied. The Non-Occupational Pesticide Exposure Study found that even in households identified as "low-use homes," the air contained up to 5 pesticides. Is Chemical Pesticide Exposure a Problem for YOUR Children? If you're thinking that this may a problem for other parents but not for you, don't be so sure. In a study done in Arkansas, urine samples from a group of approximately 200 children contained pesticides in nearly all samples tested. In the Minnesota Children's Exposure Study, the US EPA found a major metabolite of chlorpyrifos, a commonly used insecticide, in 98% of the participating children's urine samples. In 2004, Pesticide Action Network North America (PANNA) presented an analysis of pesticide-related data collected by the Centers for Disease Control and Prevention (CDC). The results showed that many US residents carry toxic pesticides in their bodies at levels above the government's "acceptable" thresholds. Many of the pesticides found in the test subjects have been linked to serious short- and long-term health effects, including infertility, birth defects, and childhood and adult cancers. For some pesticides, children's body burdens may vary by diet type. A University of Washington study found that children fed mostly organic produce and juice had only one-sixth the level of organophosphate pesticide byproducts in their urine compared to children who ate conventionally grown foods. The difference was statistically significant, with the children who ate conventional diets having levels above the amount considered to be "negligible risk" by the EPA but the children who ate mostly organic diets having levels below the negligible-risk threshold. The effects of pesticides may not be immediate, and when they do occur, they may be subtle (or blamed on other causes). How much pesticide exposure a child can take before it begins to affect him or her varies—factors include the level of exposure and the type of chemicals involved, as well as the child's constitution and nutritional status. But it's clear that less pesticide exposure is better. Your lawn: Learn to love clover (which will actually make your lawn greener if you leave it alone! ); pull dandelions by hand; use preventative measures and least-toxic methods to control lawn and garden pests. Your home: Never use routine preventive spraying. Take exclusion and sanitation measures to avoid pest problems. When they do arise, use least-toxic methods to address them. Check with your school district to find out their policy on using pesticides. If they're not using true Integrated Pest Management and least-toxic methods, start a campaign to insist that they do. Eat organic food as much as possible. If your grocery store doesn't carry much in the way of organics, ask them to start. Ingestion or inhalation may seem like the most obvious ways pesticides might end up inside your child, but many chemicals, including pesticides, can be absorbed through the skin. (Remember how "the patch" can be used as a delivery system for certain pharmaceuticals.) 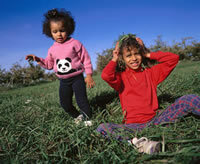 When children crawl around on treated lawns or carpets, they may be absorbing pesticides. "The body of evidence in scientific literature shows that pesticide exposure can adversely affect a child's neurological, respiratory, immune, and endocrine systems, even at low levels. Several pesticides, such as pyrethrins and pyrethroids, organophosphates and carbamates, are also known to cause or exacerbate asthma symptoms."